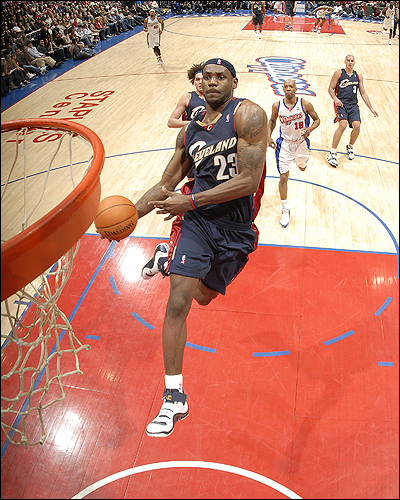 Sure I'd miss Bron-Bron if he jumped for Europe...but tell me the NBA-panic and would not be priceless! Click Here if you Want more Hardwood Luv from Greg Gamble. While the rumor King James would consider leaving for Europe if he received $50 M may have more BS than the gerbil in Richard Gere’s keester, the principle theory behind the overseas jump is intriguing. Only in America do sports organizations need salary limitations because GMs are too stupid to handle their high-priced, and many times, uneducated superstars. Sure it’s more annoying than Paris Hilton walking, talking, or doing anything besides slurping sausage on video when a Steinbrenner overpays for your boyhood hero, but how often has it actually worked. In my opinion, if an organization can’t compete with the big-boys, you might as well contract their azz resulting in an improvement of the overall product. How about teams like the cost-saving Marlins & Twins who use a completely different blueprint and are able to stay competitive year after year…while also showcasing players that can be easier to root for? Listen, it’s not like I’m not a stargazer and wouldn’t hit-up the Spearmint Rhino if Kobe Tai was performing, but you know what would probably happen? She’d show-up late and give a half-azz show…unlike the amateur in Gary, Indiana who actually acts like she like you. Obviously I want the best-of-the-best playing in the U.S., but as we’ve seen in the last few International Basketball events, teams with structured organizations and players willing to actually be coached can be more entertaining than a GM that let’s a superstar and his entourage run the show! Just like her belt...u saw the belt, right?, some seem to think Pigskin fans should feel lucky Brett's back...but not me! Blah, Blah, Blah…Brett Favre gives me more of a headache than listening to Ozzie & Kenny tell me they won the World Series and get no respect...just get us a MFin starting pitcher please! Even though Chuck James has received a chilly reception at home and at the beach, I'll bet he wades through SF's line-up smoothly this afternoon! Daily ATS, Lovely Ladies, & Sports Banter...is this Heaven? No, it's Iowa and Jamaal Tinsley's playing the point! This page contains a single article from August 6, 2008 11:41 AM. The previous days article was Daily ATS Plays & Friendly Faces by Greg G.
The next days article was Chicago Bears Preseason Opener Prediction.